This year Folkmoot has a talented group coming from Finland. KimuranttiKirjavat will be one of the featured dance troupes at Folkmoot 2016, which begins July 21! Kimurantti, which means tricky, and Kirjavat, which means colorful, were originally two separate dance groups part of the Youth Association Rajan Nuoret. The groups merged together to form KimurantiiKirjavat and have performed together nationally and internationally. They are made up of Finnish folk dance performers from Lappeenranta, which is a southeastern city, about 30 kilometers from the Russian border and located along the shores of the largest and most beautiful lake, Saimaa. The group is comprised of dancers from 16-28 years of age with most of them finding their passion for dance at an early stage of life. Merja Skytta is the director of the group and has over 20 years of experience leading folk dance groups in Finland. The groups have traveled, separately and together, to international competitions and festivals in Europe, Asia, and South America. You can find them on Facebook and on Instagram. KimuranttiKirjavat build their dances based on traditional Folk dances with some modern choreographies added. The Karelian folk dance is lively, fast-paced, and rhythmic. To help bring this Finnish tradition to life a three piece band will be joining the dance team at Folkmoot with a guitarist, violinist, and accordionist. Karelia is a region that encompasses both areas of Finland and Russia giving the Karelian dance Russian influences. For example, most dances in Finland do not include male solos but they are found in Finnish, Karelian folk dance. The 33rd Edition of North Carolina’s Official International Folk Festival begins July 21 and runs through July 31, with parades (new parades in Asheville and Franklin), cultural events, festivals within the festival and – of course – those glorious, dramatic and colorful dance performances at venues all over Western North Carolina. Find our calendar of events, performance schedule & online tickets sales by clicking right here! Named a Top 20 Event in 2016 in the Southeastern U.S., according to the Southeast Tourism Society and by USA Today as one of the Top Twenty Festivals in North Carolina, Folkmoot is a ten-day event featuring more than 200 international performers from ten countries with performances in 12 Western North Carolina communities. Lodging and accommodations can be found here and Lake Junaluska Conference & Retreat Center is for the first time offering weekend hotel packages for Folkmoot visitors. New parades & events will spark Folkmoot Festival 2016, the 33rd edition of North Carolina’s official international folk festival set for July 21 to July 31. The schedule of events has been announced and in addition to new events all over Western North Carolina, the line up includes new public parades in Asheville and Franklin, international issues discussion forums, a new children’s carnival and the always popular – and free – Parade of Nations through downtown Waynesville moved from Friday afternoon to Saturday morning to better serve busy families. 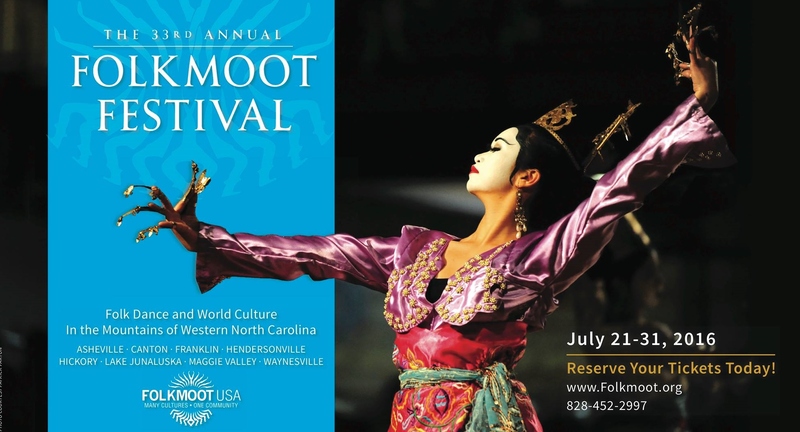 Named by USA Today as one of the Top Twenty Festivals in North Carolina, Folkmoot is a ten-day event featuring more than 200 international performers from ten countries with performances in 12 Western North Carolina communities. Folkmoot is also a Top 20 Event in 2016 in the Southeastern U.S., according to the Southeast Tourism Society. Folkmoot performers are primarily college students who are acting as cultural ambassadors for their home countries. For the 2016 Festival groups will travel from China, the Dominican Republic, Finland, France, Ghana, Japan, Peru, Poland, Romania and a special U.S-Mexico collaboration. The 2016 Festival will also include performances by the Eastern Band of Cherokee and other local Appalachian dance groups and bluegrass bands . You can see them all, featured together and with videos, on our Folkmoot Performers of 2016 page. Ticket packages and tickets for individual performance are available here as they are added. Keep checking back for updated individual performances. In the meantime, please explore our year-round events. The Folkmoot Box Office can be reached by phone during business hours: 828-452-2997 , ext. 207. Please always check our Schedule of Events for upcoming Folkmoot events, showcases and classes and follow our social media posts for the latest updates on Facebook, Twitter, Instagram, Tumblr, Pinterest, YouTube, Snapchat (mobile only). Please, always use #Folkmoot2016, the festival’s official hashtag,when sharing Folkmoot information and events or to search for the latest news. Folkmoot, literally a “meeting of the people,” provides programs based on cultural exchange, designed to build global relationships, foster cultural understanding and develop community prosperity. Folkmoot creates opportunities for individuals and communities across the globe to build a deeper sense of connection, mutual respect and shared purpose.